In his novel, ‘A Daughter’s a Daughter,’ author Nash Candelaria presents a fictional account of the lives of a family of Hispanic women from New Mexico spanning three generations. Although each woman grew up during different time periods, they are bound by family, tradition, and strength. Each generation of women portrays personal growth and how they define themselves and their lives. There is growing independence from one generation to the next while the bonds of their Chicano traditions keep them together. A major theme is the role of women in the family and society, from obedience and servitude to freedom and independence. As well, the disappearance of Liberata’s husband is a mystery that surfaces throughout the book until its surprising revelation. As each generation progresses, the affects of war on the family, the role of religion, love, and loss, becomes central themes. The writing is rich in Hispanic culture and traditions from pre-World War II to present day. 'A Daughter's a Daughter' is highly recommended to readers interested in Hispanic culture and women's issues. 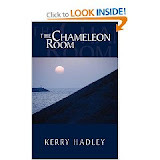 In her novel, The Chameleon Room, author Kerry Hadley tells the story of three young people living together in England who feel the effects of a mysterious past on their current lives. The narrator relates the story of life with her lover Angelo and her emotionally tortured friend Kary. The three grew up together in Devon, England, and were raised by a mysterious woman known as the Doctor. The main conflict of the story revolves around Kary, a young woman with severe mental health problems. Kary becomes obsessed with her married boyfriend Clive and develops an intense and dangerous desire to become pregnant. Kary’s disturbing actions cause the Narrator to reflect on their childhood in order to discover how the three came to be together. As the story unfolds, dark and disturbing secrets are uncovered, revealing a number of themes that include: the relentless need to be loved, love, obsession, moral and ethical dilemmas regarding reproduction, loss, and death. The Chameleon Room deals with dark revelations of childhood that shaped the Narrator, Angelo, and Kary. The writing is rich in symbolism and imagery. The story is an intense and dark look at characters who struggle to face their internal demons. Structurally, I found myself going back to reread the first few pages of the beginning of the book to get a complete understanding of the ending. It may have been helpful to shorten the foreshadowing at the beginning and expand the ending. The Chameleon Room is a well written dark drama that exposes many issues of human morality. With its many surprises, the plot of unraveling the three characters childhood secrets will keep readers engaged from start to end. It is highly recommended to readers who enjoy compelling stories of human frailty. 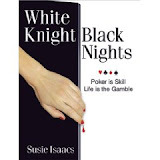 In her novel, White Knight, Black Nights, author and World Series of Poker Ladies Champion, Susie Isaacs, tells the story of one woman’s journey of survival and self discovery. In White Knight, Black Nights, Isaacs chronicles a tale of two families that span the years 1935-1995. The story begins by focusing on The Sommers, a wealthy family from North Carolina, and The Johnsons, a middle class family from Nashville, Tennessee. An in-depth historical account of both families sets the stage for the two protagonists, Rachel Lee Johnson and Dalton Sommers, to meet. The plot focuses on the main protagonist, Rachel Lee, and her life as a single mother. As well, an account of Dalton Sommers and the struggles he faces with a dominating, fanatically religious mother who is the fundamental influence in his life. Struggling to break free of his mother’s control, Dalton chooses a life that goes against her personal beliefs and wishes. One night he meets Rachel Lee while she is working at a Bar and the two begin an intense seduction and relationship. From that point on, Rachel Lee and Dalton eventually marry and begin a life of accumulating wealth and prosperity. They eventually find themselves living the good life in Las Vegas, Nevada. Unbeknownst to Rachel Lee, Dalton’s life begins to unravel as he becomes caught up in an unmanageable and wild lifestyle. As Dalton drifts away from Rachel, she becomes involved in the world of poker and begins a career as a writer of stories about people involved in poker. Dalton’s life takes a different turn as he loses himself in high risk endeavors. The story is a tale of romance, adventure, love, betrayal, loss, and rebirth. Readers will be engaged and root for Rachel Lee as she comes to terms with her marriage, her life, and her future. Readers will also feel for Rachel’s dedication to her husband and the overwhelming heartache she endures. With a host of unique and compelling characters, the narrative is very descriptive and compelling; with many poignant themes developing which tap into the self-reliant spirit within all of us. With many surprising twists and turns, White Knight, Black Nights is a well written story that effectively draws on life skills and poker skills to unravel an inspirational story of one woman’s survival.